Reading is a beneficial activity for cognitive and mental health, and scientists have long postured that being read to in early childhood is a strong determinant of linguistic and emotional intelligence. And that connection goes far beyond Kindergarten—there are a great number of brain benefits to reading for adults, too. While many of these benefits can be experienced regardless of whether you’re reading on your iPad or from an old leather-bound book, there are also some that are exclusive to the real thing. But we’ll get to that later… Here are just a few of the mental and cognitive benefits to curling up with a good book. 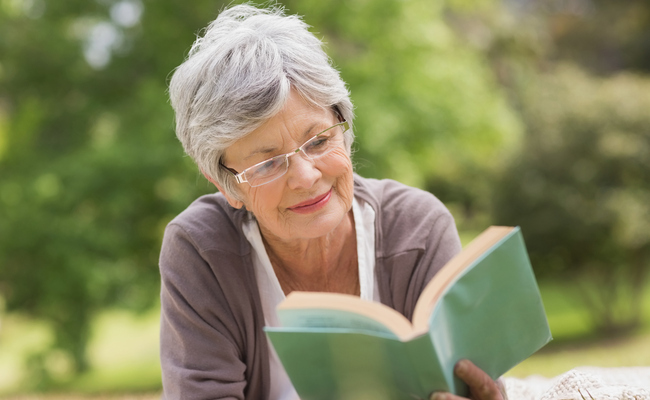 First, and perhaps most obviously, reading can be an incredibly good de-stressor. A study conducted by researchers at the University of Essex found that reading for just 30 minutes can be even more effective at relieving stress than listening to peaceful music or sipping on tea. And that’s important, because reducing stress levels is a big concern for many people in our modern society. When we follow along with our favorite characters in a story, we develop skills for learning how to perceive the way they’re feeling. In fact, we begin to feel the same emotions ourselves. This mental process, scientifically referred to as “mirroring” and often called empathy, is a strong marker of social and emotional intelligence. “… Literary fiction temporarily enhances what’s known as theory of mind—the ability to imagine and understand the mental states of others,” reports the Sydney Morning Herald. It’s pretty obvious that reading can improve your vocabulary and grammar skills. Obviously, the more words and sentence structures you’re exposed to, the more you’ll absorb. However, what may not be quite as obvious is that reading can also improve mathematical skills, especially in kids. Finally, reading a physical book can also impact a third form of intelligence: Spatial intelligence. Spatial intelligence has to do with perceiving how distances and directions interact, particularly with regard to one’s place in space. This is the kind of intelligence that’s required for map reading, building, planning and even sports. According to the National Reading Campaign, reading from a book helps you build spatial awareness, as you’ll become cognizant of where you are in the story on linear and temporal lines. What Does Watching TV vs Reading a Book Do For Your Brain? Give kids books for Holiday presents! And read to the little ones, listen to those who can read show off their ability. I cannot imagine a life without books. One thing I will NEVER do in this lifetime is "download" a so called book. reading was never an effort but one of my deepest pleasure, the main source of openness and evolution, it's sad that many people will never taste that kind of Joy. I was read to when I was a baby--my Miranda Rights! My Dad read to us when we were small, then in school, the first half hour of the day, our teacher read to us [the whole room. grades 1 thru 4, about 20 kids] to settle us down for the day. You could hear a pin drop. We loved it. Reading opens doors to other times and places and personalities way beyond our small town farming community.